Are you planning on moving to Tampa and wondering how Tampa movers, Big Boys Moving and Storage, can help you with that move? 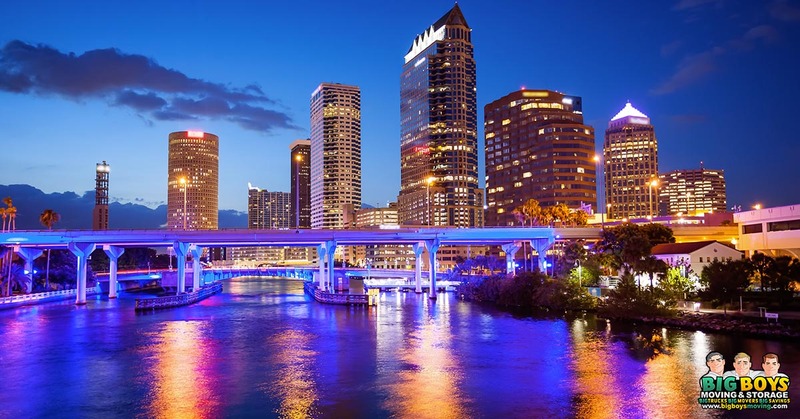 When it comes to Tampa moving companies there are a million and one companies to choose from, but what is it that makes Big Boys stand out from the competition? The quality of service that we offer, of course! We are dedicated to making your move go without a hitch and today we’re sharing just a few of the ways that we can do that! Moving to Tampa: How Big Boys Moving Can Help! One of the most time-consuming parts of moving is packing your boxes. It also happens to be one of the most frustrating parts of moving for most people too. But imagine what it would be like if you were moving to Tampa and didn’t have to pack a single box yourself? Big Boys can help you with that! Our professional and courteous moving crew can take care of all of your packing needs while working with your moving schedule and working around your working schedule so that you are not inconvenienced. You might not realize it, but the type and quality of packing materials that you use to wrap and pack your possessions when you’re moving to Tampa are crucial! Pick cheaper packing materials and Tampa moving companies can only do so much in getting your possessions to Tampa in one piece. Fortunately, moving companies Tampa trusts like Big Boys Moving only use professional grade packing materials when wrapping and packing your possessions with care. That means that you never have to worry about cheap packing materials getting half of your belongings smashed on the way to your new home! Plus, if you’re not sure that you can afford a full-service move, we also sell our professional packing materials so that you can use them yourself. As a moving company, we often get portrayed as a “luxury” service that most families cannot afford. But, did you know that Big Boys Moving and Storage are also a small family run business who got to where we are today by being conscientious about money? We know that you work hard for your money which is why we are dedicated to providing you with professional quality moving services without the exorbitant fees. How do we do this? To start with, we offer a huge variety of moving packages so that you can choose a service that fits your budget, but that’s not all. We also offer moving packages that include packing supplies and vast discounts based on the type of move you are requestioning. Then, on top of all of this, we also offer great savings coupons on top of our already low rates. You won’t find another moving company Tampa that can offer you such top quality service for a price that is so affordable! Here at Big Boys Moving and Storage, we don’t just offer the traditional moving packages that come with low price tags, we also offer slightly less traditional flat rate moving services too! So, if you’re planning on moving out of your studio apartment and need a hand with the logistics, ask us about our flat cost moving special to help you to get this done on an extremely affordable budget! Plus, if you don’t qualify for flat rate moving options, you can still save money on your move by asking us about our current coupons, specials, or deals! Whether you’re unsteady on your feet, lack the strength to lift and carry boxes full of your possessions, or whether you simply prefer not to do the heavy lifting, Big Boys can help you with that too! Our professional moving crew is fully trained and have plenty of experience in lifting and carrying even the heaviest boxes. From getting your boxes loaded into the moving truck to getting them unloaded at your destination, our crew members can take care of all of your heavy lifting needs. 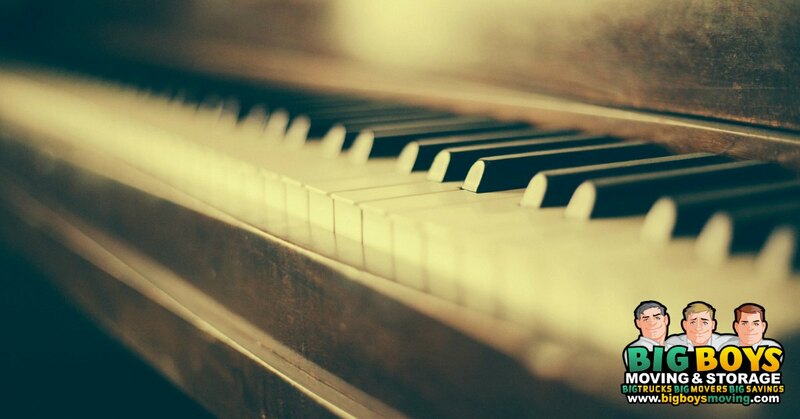 Don’t worry though, when it comes to those grand pianos, they have tools that do that kind of heavy lifting for them! If you’ve ever tried moving yourself from one home to another, you likely know that when moving to Tampa, this isn’t something that you want to repeat. Not only because of the frustration involved, but also because when you tackle your own move, you undoubtedly wind up running late. Work can get in the way, procrastination can cause havoc, lack of planning or coordination can drag your move out much longer than expected. Hiring the Big Boys professional moving team to help with your move, however, can help to keep your move on track and avoid the pitfalls of procrastination! When you call and book our professional Tampa movers for your upcoming move, we don’t just give you a date and leave you hoping that we show up on time, we give you a date and a time and we show up on that date at that time! Unlike other moving companies in Tampa, we understand that your time is valuable and we’re not going to waste it by making you wait for hours for us to show up! We give you an appointment time and we show up on time so that you can get your move out of the way and get back to living your life, your family, and your job! Looking For Moving Companies Tampa Trusts? When moving to Tampa you want to hire from moving companies Tampa trusts and Big Boys Moving and Storage has been voted as Tampa’s top moving company for ten years straight! If that doesn’t speak for our reputation, we don’t know what does! To book our professional and courteous moving team to help you when moving to Tampa, just give us a call at 813-936-2699!